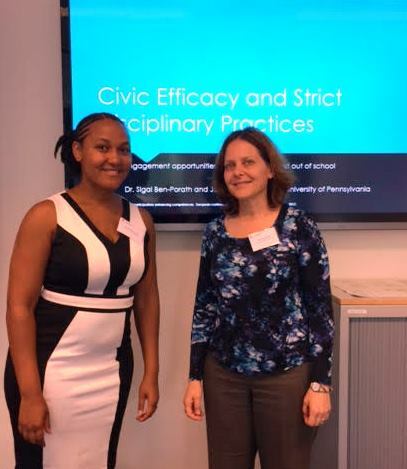 Update sent by MPP alum Jasmine Blanks Jones, now a Ph.D. candidate at University of Pennsylvania: "This presentation was given at the 5th annual European Conference on Citizenship Education under the theme "Political Participation: enhancing competences" in Groningen, Netherlands. I presented with my advisor, Sigal Ben-Porath, on an ethnographic study we have done in urban school settings over the past two years entitled "Civic Efficacy and Strict Disciplinary Practices". The strict ‘no excuses’ school model has become prevalent in charter schools serving low-income and minority students across the United States and is spreading in European schools. While researchers have examined the academic achievement of students enrolled in ‘no excuses’ schools, scholarship has yet to address how the model impacts students’ civic opportunities and civic/political efficacy. We investigate the civic consequences of the ‘no excuses’ school model on low-income and minority youth. The 28-month qualitative study asks: (1) How does the ‘no excuses’ context influence civic and political opportunities for engagement in a school community? (2) How do the civic and political practices and sense of efficacy of students attending ‘no excuses’ charter schools compare with those of students attending other school types? We conducted interviewed, focus groups and surveys and observed classrooms and shared spaces at both schools. The data presented in this paper suggests a negative connection between strict school environments and political efficacy and participation."